This top-of-the-line Grubee brand 49cc bike motor kit comes in a V-Frame mount. With this kit you'll be able to convert your bicycle into a gas-powered motorized bike. These 4G T-Belt can be installed on almost any mens bike, mountain bikes or beach cruiser. The V-Frame mount fits 26" beach cruiser bikes and most 20" to 26" mens bike. This 4G T-Belt Drive motor has the advantage of no oil contamination and no gear noise. And now with new and improved one-way bearing. 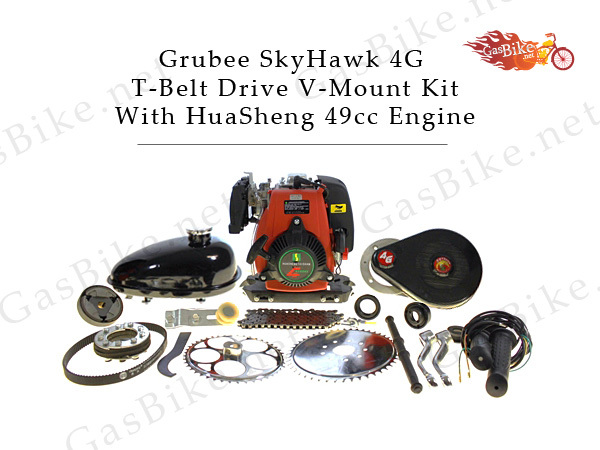 Pay no sales tax (except CA) on this 4-stroke gas bike motor kit! This bicycle motor engine kit fits most mens 24" and larger bicycles which includes mountain, cruiser, chopper and road bikes with a V-frame with at least a 8.5" height clearance for the engine. Larger frame size requires drilling into bike frame and use of the universal face plate. Dimensions: This 49cc bicycle motor engine kit is about 8.5" height 7" length 5" width and fits on most standard 24” – 26” or 25mm 29mm frame bicycle frame tubes. Larger frame size requires drilling into bike frame and use the universal face plate. This engine kit only adds about 20 lbs to your bike. Orders received Monday - Friday by 12:00NN PT are eligible for Same Day Shipping! Except for USPS which ships the next business day.